189.99 GBP Only 1 left In stock, ready to dispatch. 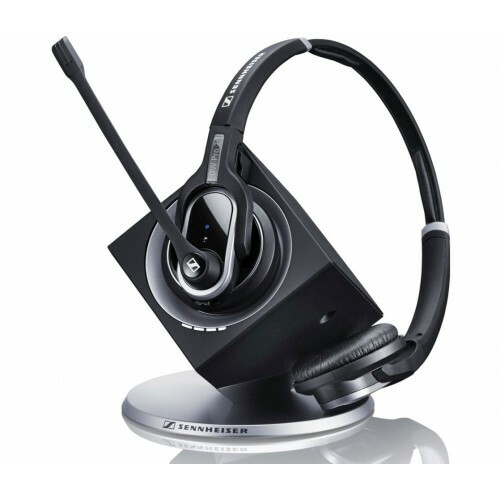 The Sennheiser DW 30 USB ML is a stylish binaural headset designed for use in such places as noisy call centres and other busy, open-plan office environments. It provides a wide range of features, excellent audio quality and a comfortable design suited for wearing throughout the day. Using DECT cordless technology, your employees will be able to work with a great deal more freedom while not having to worry about interference due to wireless networks in the vicinity. It provides up to eight hours of talk time in wideband audio mode, and on-ear controls allow you to mute the noise-cancelling microphone or put the volume up and down. Comfortable to wear with intuitive controls and USB connectivity for today's VoIP telephony systems, the Sennheiser DW 30 USB ML is ready for use in any professional call centre environment.